Hartsfield-Jackson is one of the world’s busiest airports and serves as a major hub for Delta Airlines. An average of 275,000 passengers passing through it with approximately 2,500 flights arriving and departing from the airport each day, and the airport is busier than usual this time of the year thanks to the holiday season. However, a power outage today cancelled all flights in and out of the airport and caused even more planes to be diverted. The lights flickered once. That was really scary. And then they flickered again and they didn’t come back. And it’s been about an hour now and it’s just pitch darkness in the airport. Olivia Dorfman described to The AJC by phone what she witnessed in Concourse D when the power went out. “Maybe 10 minutes later a buzzer went off in the background ... and every so often bright lights flash in the ceiling,” Dorfman said. Near the D9A gate, she said smoke filled the area and at different times airport workers tried to herd passengers toward the smoky area and away from it. After at least one other woman said she wouldn’t stand in the area that smelled of acrid smoke like from an electrical fire because she suffers from asthma. She and others then walked back toward the gate, Dorfman said. “A man is just yelling, ‘Go this way,’” Dorfman said. Terminals were left dimly lit or completely dark, Anyone hoping to buy food had to pay in cash, as all the systems were down. Handicapped travelers had to be carried up and down stuck escalators. 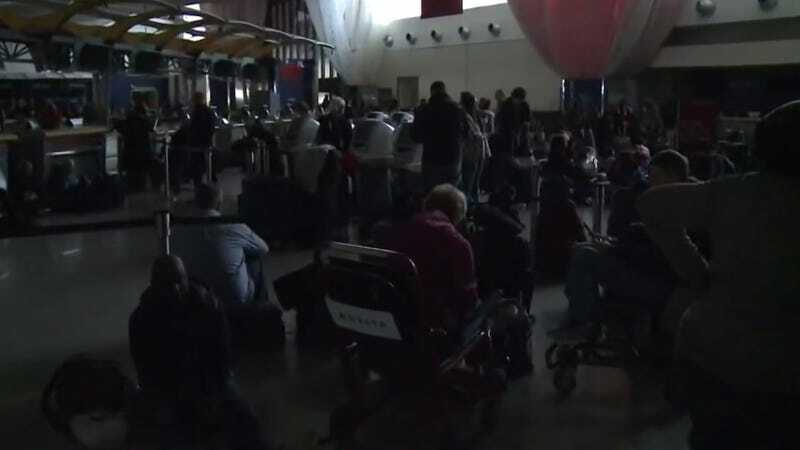 Some travelers reported that there weren’t backup generators kicking in during the outage in certain parts of the airport, either. Cell services were also overloaded with passengers trying to rebook flights or reach friends and family. Georgia Power, Atlanta Fire and Rescue and airport personnel are working to restore power to the airport, but as of this writing, parts of the airport have been in darkness for nearly seven hours. Power has been partially restored to some sections, but not all yet, reports CNN. Police have been working to evacuate the airport—including the SkyTrain that goes between terminals— in full and have been keeping anyone from entering the airport during the outage. Atlanta Police Sgt. Warren Pickard told ABC News that no injuries have been reported, and that those stranded at the airport have been acting in an orderly fashion so far. Between 80 to 100 planes were stuck on the airport tarmac due to the outage, according to a Federal Aviation Administration report. Many airlines eventually evacuated these passengers on airstairs, ABC News reports. All inbound flights are being held from takeoff at their points of origin, and those already in the air were diverted to other airports. The fire that may have caused the blackout was extinguished, and a statement from the airport says they hope to have the power back on to the entire airport by midnight. The FAA Tower at the airport is already back up and running, however, it can’t do much as the airport terminal equipment is still down. Passengers booked to fly through Atlanta on Monday should check their flight status, as Delta says that approximately 300 flights will be cancelled as a result of the lengthy outage. Delta was not specified whether that was 300 of their flights or 300 flights overall, however, checking to see if your Atlanta flight is still on for tomorrow is probably a good idea regardless of your airline. A piece of switchgear is believed to have failed next to the redundant circuit cables and switching mechanisms that serve the airport, which took out the back-up systems when it caught fire. Maybe it’s time to move the backup system to somewhere else?